My name is Andy, and I am a freelance writer and restaurant manager that works crazy hours and uses DFS as a way to escape from the stress that comes with my jobs. I’m certainly not a pro, but I have been a profitable player over the past few years, and getting up early to blog about my process is one of the best ways that I have found to fight depression and anxiety. 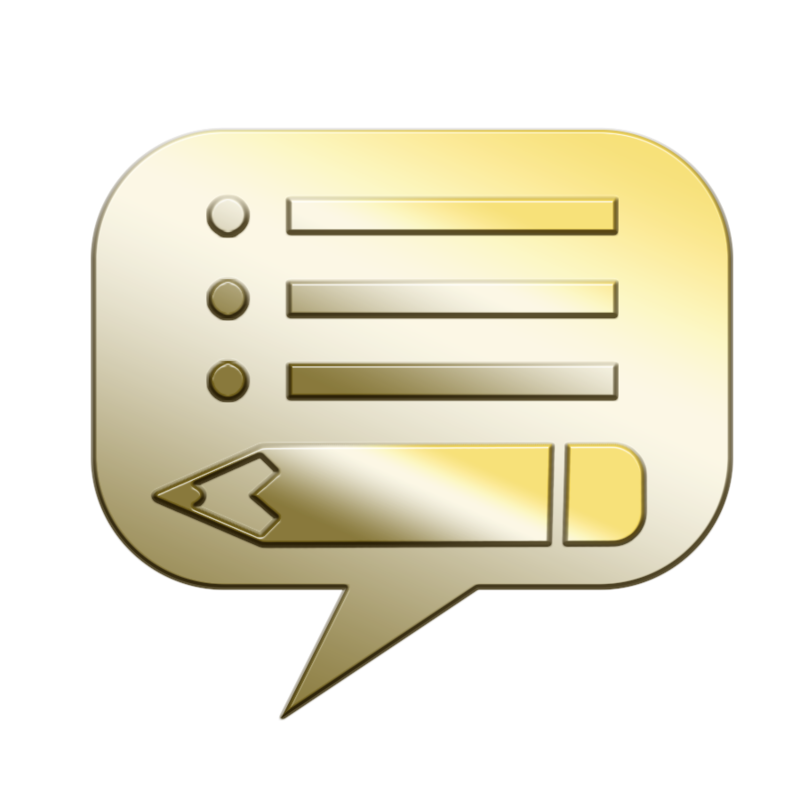 If you’d like to talk about writing, barbecue, sports, or life in general, hit me up on Twitter: @EasyMoneySelby. In order to avoid sounding like a miserable complainer, I haven’t said much about my recovery over the past few weeks, but yesterday was a big day. It’s been about six weeks since my Achilles surgery, and yesterday was the first time that I was able to take some steps with full weight on that foot. I didn’t walk very far, and my foot swelled up like a smoked sausage afterward, but I WALKED! So on account of that, I knew that I had some luck on my side last night. As I worked my way through each lineup ordered by team total yesterday, it occurred to me that I could put together a very nice lineup without rostering any true stud players. Hang onto that thought for a minute and we’ll circle right back to it. The clear and obvious play of all plays last night was Anthony Davis. The price was high, but no one else has the upside that Brow has on any slate, and he was in a very good spot last night. Another great play that jumped off the page at everyone was Karl-Anthony Towns. The combination of price and spot was excellent, and it was very reasonable to expect a 50-burger out of KAT. Now back to my lineup, which didn’t include either of them. I’m guessing that we are going to see most of the expert lineups found a way to fit Brow and KAT both. I elected to be different last night, but it wasn’t just for the sake of being different. The first thing that jumped off the page at me is that I wanted as much exposure to the Kings and Clippers as I could get. On the Kings side, that meant that De’Aaron Fox, Buddy Hield, Nemanja Bjelica, and Willie Cauley-Stein were all in the mix. 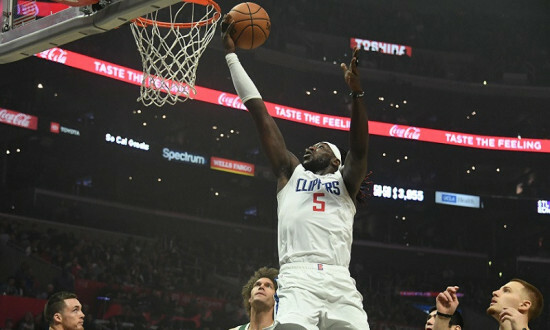 Then the Clippers I liked were Danilo Gallinari and Montrezl Harrell. 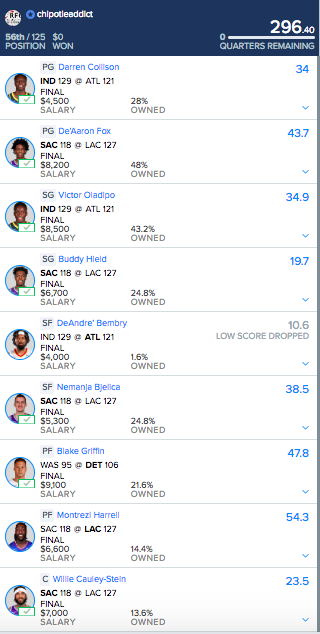 My first lineup had five of those six guys in it, but here’s the problem. 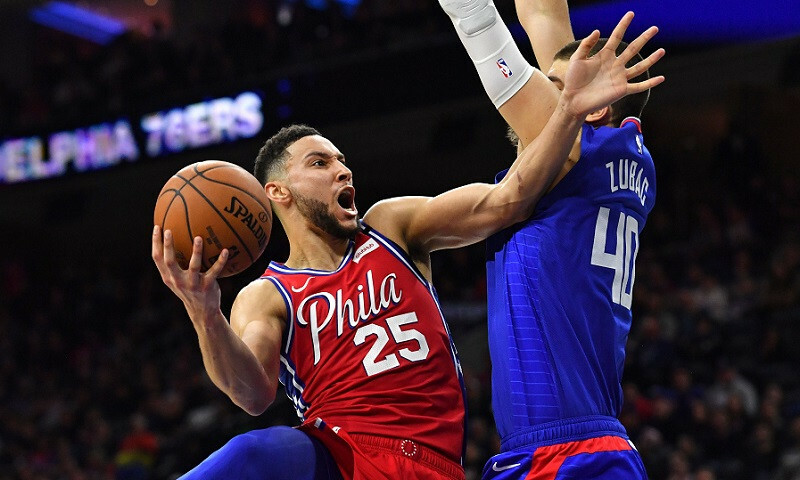 I also liked Fred VanVleet, Darren Collison, Victor Oladipo, D’Angelo Russell, Joe Harris, Blake Griffin, Nikola Vucevic, and the two studs I already mentioned. With two cheaper point guards in play, I decided to come down off of De’Aaron Fox. Then, with Victor Oladipo price basically making him a must-play, I moved up off of Buddy Hield. 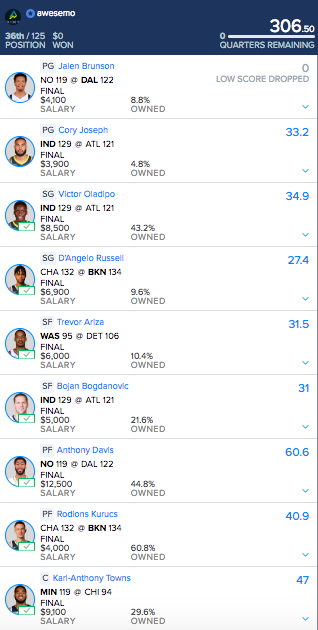 Then I thought about how Nikola Vucevic seems to show up in winning lineups a lot more than Willie Cauley-Stein, so I went with him as my center. From there, it was pretty easy to fill in with Joe Harris and Blake Griffin, who were also going to benefit from much higher than usual team totals. After seeing the disappointing results from my early game players, I went to bed thinking I would need almost a hundred points combined from Bjelica and Harrell. I actually laughed at that and went to bed. Then I woke up to almost that many points from them and a nice green spot in the money. Cool! So I was fortunate to win a couple bucks last night, but were the decisions that I made smart ones? Let’s find out. 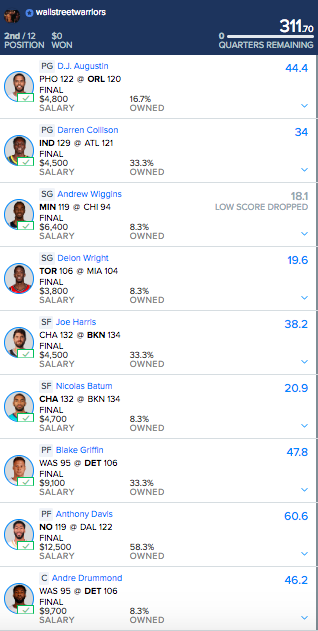 Booourns finished in the money in the $222 Single Entry Tournament with this lineup that started out fairly similar to mine. The big difference is that he went down to Jordan Clarkson as his second point guard. And when you combined that savings with Rodions Kurucs, he had enough salary left to fit Anthony Davis and then roll with Andre Drummond at C.
CSURAM88 and Hoop2410 both did pretty much the same thing as Booourns, but they used Lou Williams as their cheap SG and Bojan Bogdanovic as their cheaper SF. Then, they went with the chalky Karl Anthony-Towns at C.
Awesemo was also on the Brow/Kurucs train with KAT as the conductor, but he went a little cheaper at PG with Jalen Brunson and Corey Joseph in order to move up to D’Angelo Russell as his second SG. He also went with Trevor Ariza instead of Bjelica at SF, which ended up hurting quite a bit. The expert lineup that shocked me the most was this one from ChipotleAddict, which was frighteningly similar to the first one that I put together yesterday with four Kings and Montrezl Harrell. 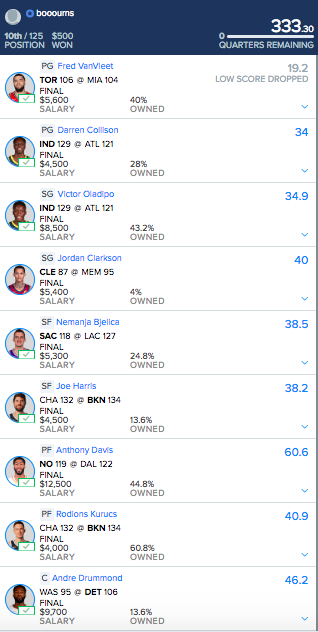 My only problem with that lineup is that I couldn’t find the extra money to get up to Victor Oladipo, and Chipotle did it by stepping down from Joe Harris to DeAndre’ Bembry. 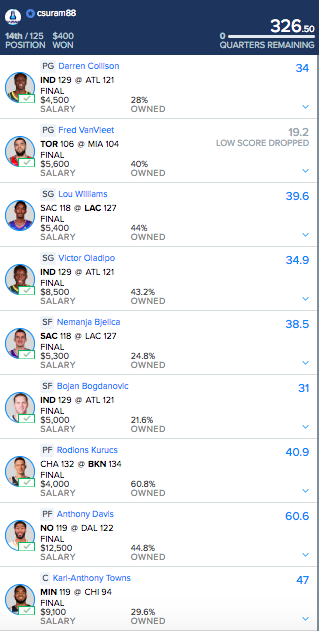 I won the AndyBowsers Slack Tournament last night, but WallStreetWarriors was right behind me with this fun lineup that went super cheap at PG and SG in order to fit Anthony Davis, Blake Griffin, and Andre Drummond. Despite the fact that I finished up in the money last night, seeing my lineup ideas fall closer in line with the contrarian ChipotleAddict than the chalky CSURAM88 and Hoop2410 is something that is concerning simply because contrarian isn’t what I was going for. I didn’t get up to Anthony Davis or Karl Towns because I was afraid of taking a bad game from guys like Lou Williams, Jordan Clarkson, and Rodions Kurucs. That was obviously not the correct approach last night as all three were able to pay off their salaries while opening up the ability to fit the true studs of the night. What does all of that mean? It means that I let myself get “too cute” last night, so the big takeaway today is to relax, trust your instincts, and play the best plays…unless, of course, you’re trying to be contrarian and avoid them. Fortunately, we get to take a fresh shot at building whatever kind of lineup we want tonight with a brand new five-game slate to tackle. So let’s get to work on that research and I’ll see you back here tomorrow with another edition of Fading the Chalk! 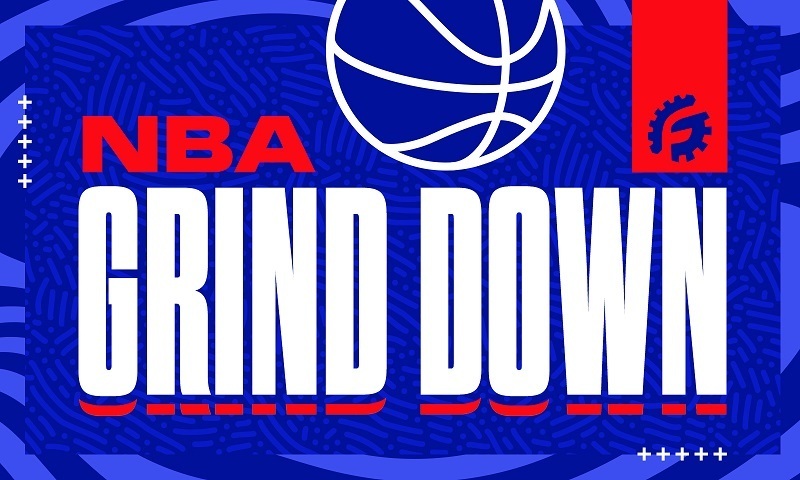 Did you play the NBA slate last night? How did you do? Did you fall into the traps of playing guys who didn’t produce? Or did you crush and find yourself up at the top of your contests? Either way, leave a comment and let me know what went into your process! 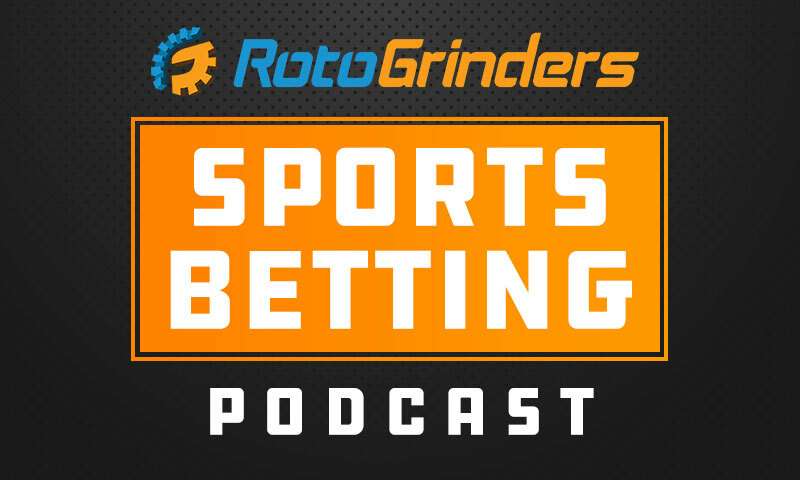 Andy is a restaurant manager that fell head-over-heels in love with the DFS world from the minute he opened his FanDuel account back in early 2015. Since he is also an accomplished freelance writer, it was only a matter of time before those two worlds collided. 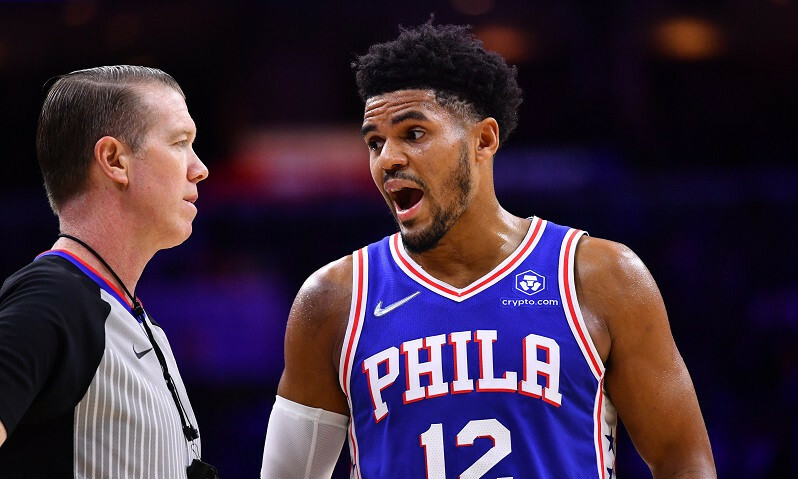 He currently writes a daily blog called Fading the Chalk where he breaks down his own lineup decisions along with the lineups of some the best in the business. You did kind of the same thing I did yesterday. My biggest mistake was considering Jalen Brunson at all. But most everyone thought he’d start. News didn’t break that he wasn’t starting until later, but I could still react to it on DK. Unfortunately, my build did not give me many options. So I moved off Brunson, but also moved off Lou to Jamal Murray so I could fit in Wes Matthews. It’s a move I thought gave me a higher floor than simply pivoting from Brunson to someone like Avery Bradley. Lou ended up outscoring both Wes Matthews and Jamal Murray. So much for my logic. After reviewing my lineup from last night, I too got too cute with it, hard not too after being chalky AF on xmas. Oh well, nice 5 gamer tonight! Really enjoy your articles! Congrats on the milestone with regards to your recovery! Remain patient through the healing and therapy process. 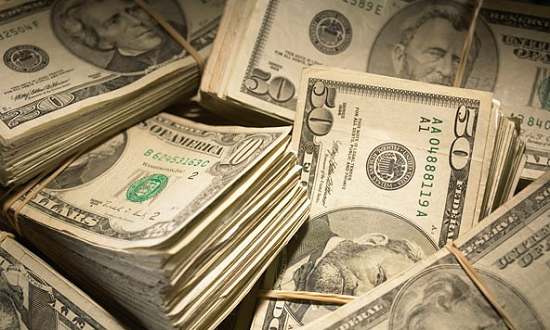 Cash-style lineups in smaller and single entry tourneys. Thanks for the shout out Andy ! I thought I had you but you ran me down as usual – nice work!